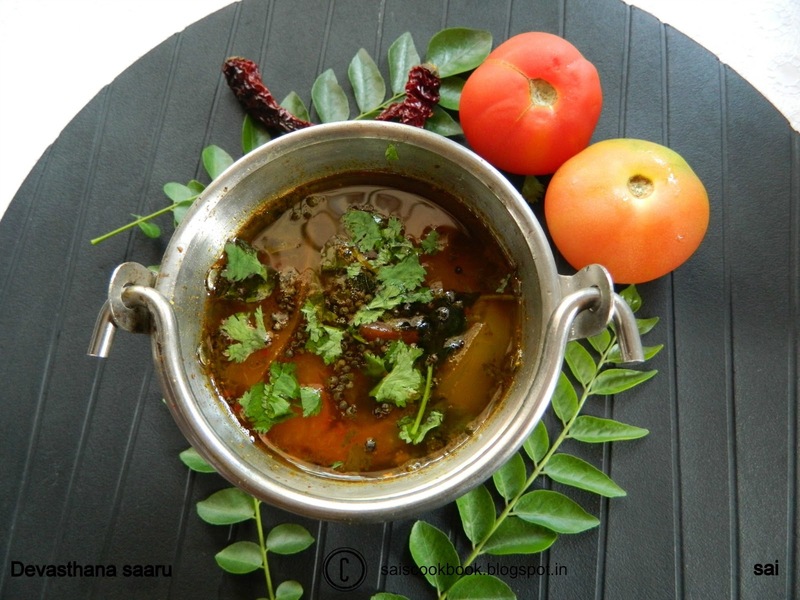 Devasthana Saaru means saaru(soup) which is served in the temple which is authentic,aromatic and heaven.The aroma is strongly catchy that will awaken all your senses.Traditionally it is served with white rice on a plantain leaf. Devasathana means temple and Saaru is a kind of soup.The best combination with the saaru is white rice,papad,pickle,curds and buttermilk,sounds simple but yet tasty.You may also relish the saaru like a soup.I like to relish it by mixing it with curds or buttermilk which gives an extra punch.There are several versions of this recipe.I adapted this recipe from my fb friend Seema.D.Shenoy.The result was too good.We,GSB’s,have a huge collection of the saaru recipe which I will upload as and when I prepare.Whenever I find an interesting recipe I love to prepare it…As per my knowledge it is a must in our community to serve saaru with the main course at any traditional functions…This recipe is definitely a keeper. Roast all the ingredients in the oil mentioned under ingredients to be powdered except turmeric powder and hing, until light brown in colour,once it turns brown,add hing,off the flame and then add turmeric powder. You may also add little water and make a paste of the roasted ingredients along with the coriander leaves and tamarind to a fine paste. Meanwhile take the tomatoes and the water in a vessel and cook the tomatoes until it gets cooked(25 minutes approx). Add salt to taste,jaggery and saaru powder/paste,take a boil and simmer for 10 minutes to cook the masala and then off the flame. Heat ghee in kadchi,splutter mustard seeds and then add curry leaves,fry for half a second and season it to the saaru. The reason to add hing at the end while roasting the ingredients as it catches fire easily and gets burnt. Turmeric powder burns easily,so it is added once the flame is turned off. Kadchi is a small frying pan which is specially used for seasonings in the Indian cooking. I used hing paste or kadha hing because it has a strong flavour which enhances the taste and aroma in the dish. You may also add tender coriander leaves stems in the saaru, once you add saaru powder in the saaru which is one more secret. Can you pls post Mulki version of Devastahana Saaru ? Can you pls post mulki version of Devastana Saaru ? Your saar looks yummy. I will prepare it now and will let u know…. Do u have any idea how Mysore Sambhar is prepared. I usually do not go to an extent of leaving a reply after trying any recipes. 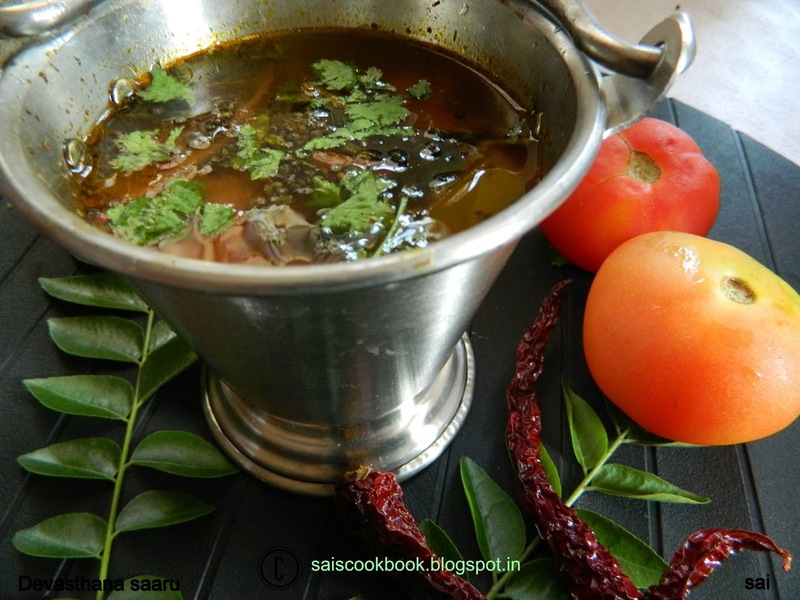 I am compelled to do this time as I got the exact flavor of the rasam as it tastes in one of the popular Temples in Karnataka and I have been experimenting on my own all these days to achieve that flavor. With your recipe I was able to get the same taste and aroma Thanks a ton. Made this in America Geethmai, delicious!